Courtesy S Carter Enterprises/Roc Nation/Parkwood Entertainment/ColumbiaIt’s finally here: the long-awaited joint album from Beyonce and JAY-Z. The surprise disc, Everything Is Love, arrived Saturday via Tidal. The nine-track release is credited to The Carters; a bonus track, called “Salud,” is also available on Tidal. 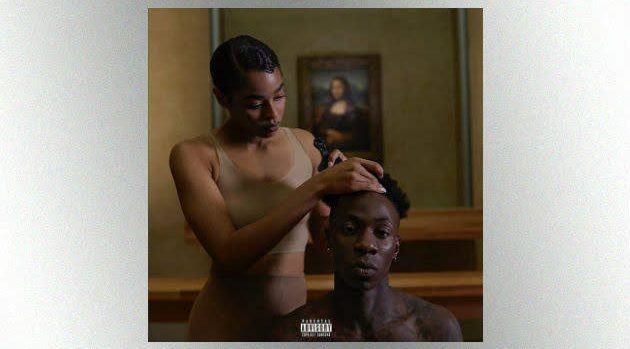 The album cover features a woman combing a shirtless man’s hair in the Louvre museum in Paris, in front of its most famous painting: Da Vinci’s Mona Lisa. That image is taken from the video for one of the tracks, “APE S**T,” which was also shot in the Louvre and was directed by Ricky Saiz. It feature Bey and Jay standing in the Louvre together and separately, wearing various outfits. At one point Bey and a group of female dancers perform in a line in front of one of the museum’s most famous paintings: The Coronation of Napoleon by Jacques-Louis David. In the video, the couple is also seen gazing at the Mona Lisa, standing on top of the stairs in front of one of the museum’s most famous statues: the Winged Victory. On the stairs in front of them, several dozen dancers do balletic sit-ups wearing flesh-colored body stockings. We also see a number of the Louvre’s iconic artworks, such as the Venus de Milo, Veronese’s The Wedding Feast at Cana, Gericault’s The Raft of the Medusa, David’s Madame Recamier, and many others. And while Jay spits that last verse, we see a group of men taking a knee like NFL players. As for Bey, she sings, “I can’t believe we made it/This is what we’re thankful for,” which seems to acknowledge the ups and downs of the couple’s marriage, documented both in her album Lemonade and his album 4:44. Bey and JAY are currently on their On the Run 2 tour, which next stops in Amsterdam on June 19.